Law firms often tout their commitment to diversity, pointing to specific affinity groups, a dedicated diversity committee, targeted recruitment efforts and mentoring programs for women and people of color. Indeed, the legal community in the Baltimore region has undergone tremendous change over the last several decades, from the 1930s integration of the University of Maryland law school to the 1986 merger of an African-American law firm, Russell and Thompson, with Piper & Marbury (now DLA Piper), which set in motion the integration of other large, predominantly white Baltimore law firms. In February, to mark Black History Month, members of the Maryland legal community held discussions that examined diversity and inclusion in the profession, as well as additional steps that should be taken to increase diversity in what remains a primarily white profession. In a talk at the Baltimore office of Miles & Stockbridge P.C., retired Court of Appeals Chief Judge Robert M. Bell discussed the history of Pearson v. Murray, a 1936 Court of Appeals case that led to the integration of the University of Maryland School of Law. The plaintiff, Donald Gaines Murray, was represented by noted African-American attorney Charles Hamilton Houston and his mentee, Thurgood Marshall. The University of Maryland at the time was the only public law school in the state. Pearson v. Murray paved the way for the seminal Brown v. Board of Education Supreme Court decision. “It’s significantly improved,” Bell said. But Bell, the first African-American chief judge on Maryland’s highest court, hopes there will come a day when diversity in the legal profession is the norm. “The idea is to get to the point where you don’t notice it,” Bell said about what are now milestones, such as when the first black attorney in a firm makes partner or is named to lead a practice group, or is elevated to the bench. To get there, Bell said, more diversity in leadership positions is needed. “Leadership becomes very important,” he said. Fast forward eight decades since the Murray decision: Students of color made up a third of the fall 2018 incoming class at the University of Maryland Francis King Carey School of Law. But that diversity is not reflected in the makeup of the country’s top law firms. In January, the New York-based firm of Paul, Weiss, Rifkind, Wharton & Garrison came under fire when it announced its new partner class; all 12 partners were white and all but one were men. For many attorneys of color, that arc is bending toward diversity as a result of client expectations. “Law firms need to rethink client relationship-building as part of how you develop associates,” said James Henry DeGraffenreidt Jr., former chairman of the board and chief executive officer of WGL Holdings Inc., the parent company of Washington Gas. “As your market changes, you need to be facing the market in a way that reflects what the community looks like,” DeGraffenreidt said at a diversity panel hosted by DLA Piper LLP at its Baltimore office in February. Panelist Genève DuBois, co-leader of DLA Piper’s real estate practice group in Miami, said she wanted to be a lawyer but was initially discouraged from pursuing law and was advised to remain where she was, in the technology industry. “In law firms, successful people are white males,” DuBois said of the situation years ago. But when Chinese businesses began expanding into the United States in recent years, they needed good lawyers who knew the American legal system. DuBois, who is fluent in Mandarin and Cantonese, jumped at the opportunity. “Diversity is important because we bridge the gap of a global community,” DuBois said, explaining that in an increasingly interconnected world it helps to employ people with as many diverse perspectives and experiences as possible. 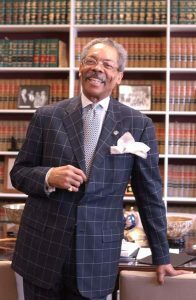 A huge shift in the world of Baltimore law firms took place in 1986, when veteran African-American attorney George Russell merged his firm, Russell and Thompson, with Piper & Marbury – one of the first times a minority-led law firm merged as an equal partner with a majority white firm. “Everything in life was separate,” Russell said at the DLA Piper event, recalling a time when black lawyers had their own firms and belonged to separate bar associations. When he was presented with the merger opportunity, Russell said, he thought of the future of black lawyers in the community. Russell’s former partner, Kenneth Thompson, now a partner at Venable LLP, said the merger resulted in a number of black lawyers joining majority-white firms in Baltimore. In addition to firms making an effort to recruit and retain a diverse group of lawyers, the profession will change because of young lawyers themselves, DeGraffenreidt said. “White men graduating know that the best and brightest in their class don’t look like them,” DeGraffenreidt said. “They’re going to choose places that have a made a commitment” to diversity.